(photo by Justin Jones / ESB) Professional fighter Mike “Yes Indeed” Reed 9-0(6KOs) will be having his first fight on the road when he takes on Alberto Morales on the Top Rank promoted card in Atlantic City. 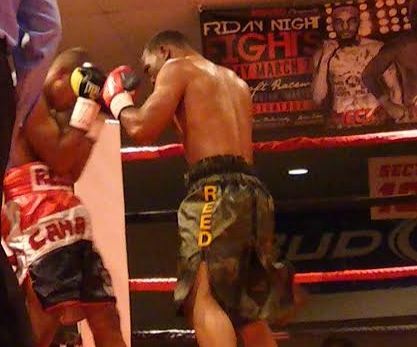 The bout is scheduled for June 14th and I got a chance to talk to Mike about his thoughts on the golden gloves, his upcoming fight, and more. Mike will finally get a chance to showcase his talent on a big stage and gain more exposure. All of his previous fights have been fought in his hometown where he has a major following, it was only a matter of time before promoters started realizing Mike’s potential. He made it clear that he plans on taking full advantage of this opportunity and will not be phased by the new location at all. Although Mike is fighting on the Top Rank card he still is a free agent. With a big performance in his next fight that might very well change. Thanks to Lorin Chvotkin for facilitating this interview. Listen to the full interview below!